I have been a Market Gardener for 4 years, a refugee from Burundi, Africa, and have a family of 8. I lived in the refugee camp in Tanzania for 12 years without hope of life for all my generations. My family and I arrived in the USA in 2007, the land of opportunities. We lived in Beaverton, OR for two years, and moved to New Columbia in December 2009. In April 2010, I met Wasongolo, Community Organizer at Village Gardens who also is a refugee, he asked me if I can join the Seeds of Harmony garden in New Columbia. Remembering the job I have done 16 years ago in my country of origin, I agreed to become a gardener to get fresh, and organic vegetables for my family. From there on, I started producing tomatoes and vegetables for my family from my small 12X12 foot garden. And I do remember with other gardeners we started requesting more land to produce more food, and gain an income. We started discussing the possibility to get more land. We got our first land donated by the Martin family on Sauvie Island in 2013. For our first year, my family decreased our food expenses by 10%. For the second year 15%, third 17%, and the consumption of vegetables were increased gradually for the same amount, and income increased too. We are encouraging other refugees, and community around us to eat vegetables. At our first Village Gardens Farmers Market, we started teaching other people in our community to eat african cultural vegetables, (amaranth, squash leaves, bean leaves, african eggplant, and other african veggies). My family does believe eating vegetables is protecting yourself against some illnesses. We are enjoying being a Village Gardens Family, we share food sometimes at pot-lucks, at our garden celebration and donate vegetables to others. In addition, my family is getting more benefit, through Village Gardens' connection we are working with MESO, (Micro Enterprise Services of Oregon), which seeks to broaden economic opportunities for the under-served entrepreneurs. With them we started a program called IDA, a matching program. In working with them, we have found a name for our small farm, Happiness Family Farm, in memory of our daughter born in the USA named Happiness. Also two of my children work with Food Works, a Village Gardens program for youth development. We are lucky to be in the Village Gardens Family, we do hold in high regard all the support given to us to increase health, and income and new opportunities are much appreciated. We can say, supporting Village Gardens in whatever it is doing is supporting the increase of growth in health, income, assets, and business skills for the families in New Columbia. Village Market is looking for a part-time Kitchen Assistant. Would you like to prepare food for our market? Do you love cooking and working in a kitchen? Do you get excited about helthy cooking? Check out our employment page for more info! 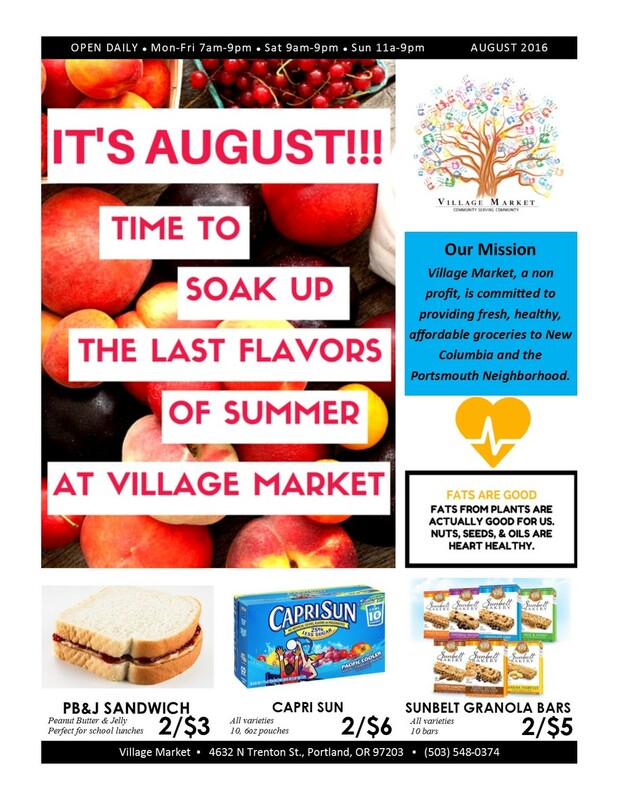 We are so excited for Village Market's Good Food program. We are issuing a new round of Good Food cards and signing up folks with SNAP for awesome healthy food discounts in the store. Village Market has everything you are looking for and making healthy choices makes your money go even further. Come in for 30% off veggies, fruit, bulk grains, bulk beans, dairy, eggs, healthy fats and many more healthy pantry items. We are halfway through the season for the New Columbia Farmers Market. We hope you will drop by any Thursday through August between 4-7pm. Join us for opening day on June 9th!! See you every Thursday this summer from 4-7pm for the New Columbia Farmers Market! We have prioritized growers, emerging small business owners and artists from New Columbia & North Portland. With growers from the community selling African eggplant beside vendors serving up sambusas, our market is a gathering space for diverse neighbors to connect over foods from home. Each week we will have music, great vendors and food demos. See you there! The Food Works Summer Crew is a volunteer leadership program. The Summer Crew is made up of 2 teams of 10 youth 14 to 18 yrs old. Summer Crew Members build leadership skills by working in the community, at the Food Works Farm, and volunteering at Sisters Of The Road. Participants can earn school credit for community service and work experience at most Portland schools. Summer Crew Members also receive a nominal $300 stipend upon the successfulcompletion of each month of the program ($150 every 2 weeks), a monthly youth Trimet bus pass and great learning experiences!!!. Also, after completing Summer Crew you will be eligible for our Academic Year and Market Crew! Help us spread the word. Applications are due June 21st! Food Works Summer Crew applications are available here. Thank you for a successful celebration! Thanks to everyone who came out to our Spring Fundraiser Celebration and Dinner. We had a great evening thanks to all our event sponsors and wonderful guests. Ticket Sales will begin soon. Stay tuned for event details. It’s going to be a good one! and welcome 2016. Thank you to everyone who donated through Give!Guide and all year long. We so appreciate the community support of Village Gardens and look forward to an abundant new year. We are in the final days of Willamette Week’s Give!Guide. Donate before midnight on Dec. 31st! Please consider a donation to Village Gardens to support food justice from the ground up. From our gardens to our market, equitable food access has our hearts and hopefully yours. Thank you! Meet Our New Program Director! We are pleased to announce and welcome the newest member of the Village Gardens team, Kris Soebroto! Kris will start at the beginning of December as our new Program Director and brings with her a strong passion in food and social justice. It’s an exciting time at Village Gardens with new projects and next seasons planning underway and we can’t wait to get her on board! We’ve include a bit more about her in her own words below. Welcome Kris from the whole Village Gardens team! I am driven by the belief that every person has a basic right to choose healthy food and that these choices must be easy, accessible and affordable. From what I can see, the programs at Village Gardens grew out of organizing for this basic right and I have long admired the organization for its integrity and commitment to following the leadership of the community. I have always been driven by the belief that commitment, passion, and collaboration is what makes communities and myself, as an individual, thrive – and this is what I see to be at the heart of Village Gardens. Back in 2009, I remember how exciting it was to witness the rising tide of a rich and thriving food culture in Portland, while at the same time, how concerning it was to see poor communities and communities of color being left out altogether. I left behind ten years working in the building trades to focus on food justice and had the fortune to land at Sisters Of The Road – a non-profit Cafe that provides healthy affordable meals served with dignity to folks experiencing homelessness and poverty. As a Cafe and Development Co-Manager at Sisters for the past 6 years, I was able to create systems and solutions to address the issue of equitable food access alongside communities who have consistently been left out of the picture. I came to understand that solutions must address immediate needs while affecting underlying issues for long-term change. Working at the heart of food justice and food equity continues to deeply impact me. It has given me perspective and understanding of who we all are and what we all deserve and have a right to as people and as a community. And it has given me motivation, focus, and a deep passion to change a system that needs to do better for each of us. I am thrilled to step into the role of Program Director at Village Gardens. I believe the work that Village Gardens is doing speaks for itself and I am thrilled for the opportunity to support its growth into the future. Village Gardens would like you to encourage your friends, loved-ones, and even co-workers to take some time to check out the Give!Guide and support Village Gardens! Help spread the word about the work we do to address food justice issues in North Portland through social media. Like us onFacebook and follow us onTwitter, and please encourage others to do the same. When you share our status, like or favorite our posts,you increase the visibility and impact of our work! Last year, Village Gardens raised close to $7,000through the Give!Guide. This year, we hope todoublethat, with your help! Village Gardens thank you so much for your time and invaluable support! You rock! We would like to share that on Oct. 13th, the U.S. Department of Agriculture’s (USDA) National Institute of Food and Agriculture (NIFA) announced $8.6 million in grants through the Community Food Projects (CFP) program to organizations that will develop local solutions to food insecurity and increase access to local and independent food systems for low-income communities. Village Gardens is honored to be one of the grant recipients! Its wonderful news! Its also great knowing that Village Gardens, is being noticed for the amazing and outstanding work that we are doing in the community! To read more, please click on the link below!